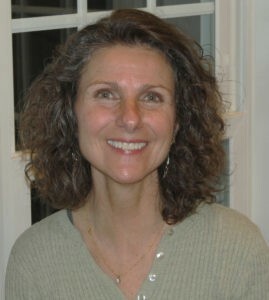 This series is written by guest blogger Pamela Cox. Pamela is an expert embroiderer, designer, digitizer and all around wonderful girl! We are so happy to have her contributing to the Sulky Blog! 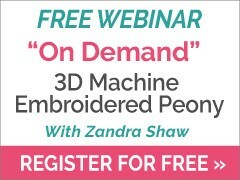 Over the next few weeks, we will explore how to embroider on various fabrics, learn which stabilizer is most effective, and whether any specialty supplies are needed in order to be successful. 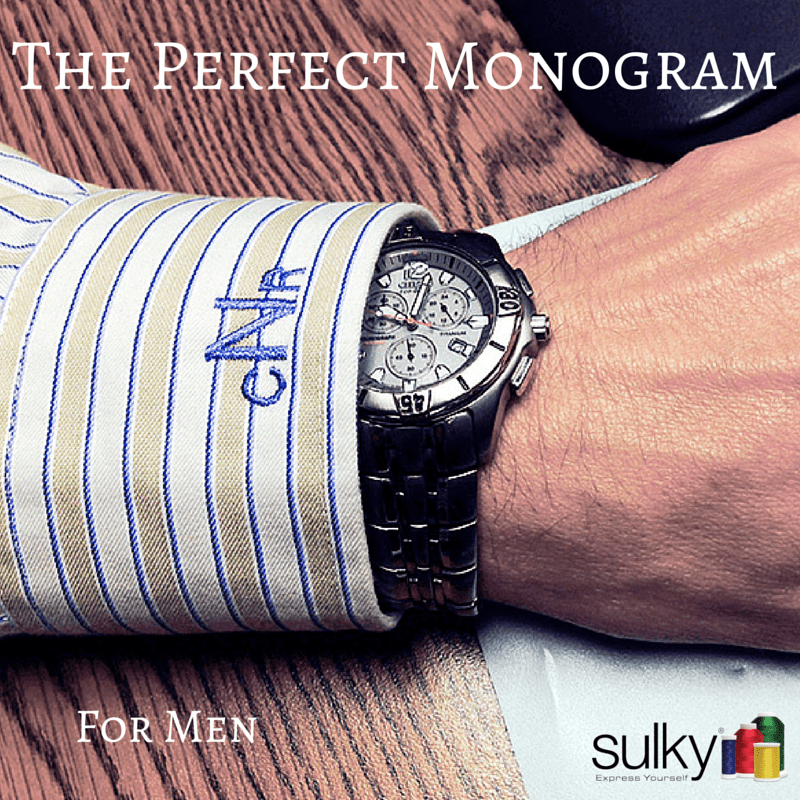 However, success is not only dependent upon the fabric and the embroidery design, but a truly professional result begins with some prior considerations and often times, a bit of practice. All fabrics which can be pre-washed and dried, should be, prior to using. Please follow the manufacturer’s directions. 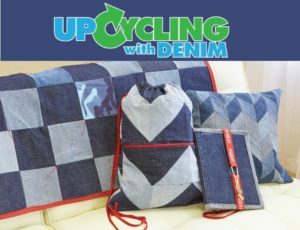 This not only allows for any shrinkage which might occur before the embroidery is stitched and the project made, but it also removes any chemicals/sizing necessary for production. These chemicals usually provide a stiffer, heavier feel to the fabric and once removed, the fabric may prove not to be a proper choice for the project on hand. Hooping is a necessary skill that must be mastered for machine embroidery. Proper hooping, including the use of an appropriate stabilizer for the project will be the difference between a finished project and a professionally, finished project. I guarantee that you will feel like you have ten thumbs on your first attempt to secure the stabilizer and fabric inside the embroidery hoop. The good news is that with practice, it does become easier. One of the reasons hooping is awkward is due to all the layers that need to be handled at one time and kept wrinkle free in the process. 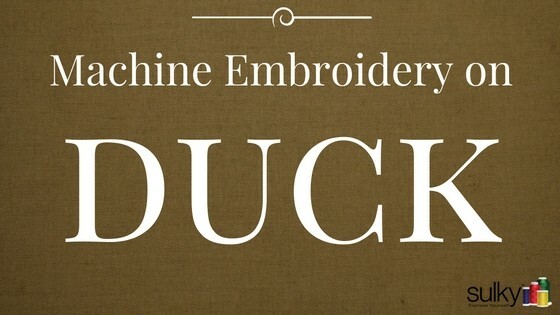 Machine embroidery requires a stabilizer to be placed underneath the fabric offering a solid foundation for the many stitches a machine will sew while producing a design. 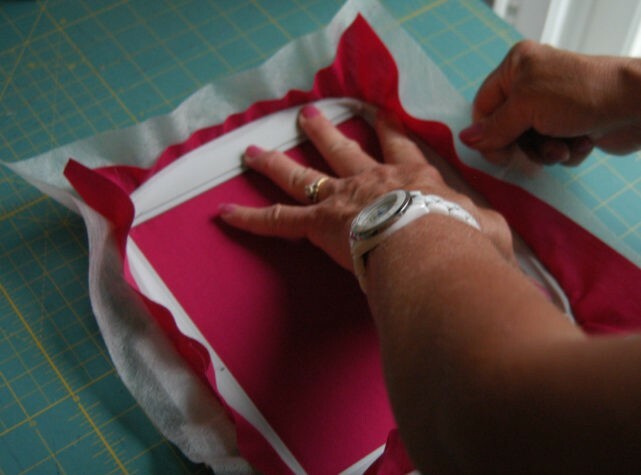 Some fabrics, such as suede or terry cloth, require an additional stabilizer placed on top of the fabric to help keep the embroidery sitting “on top” of the nap. 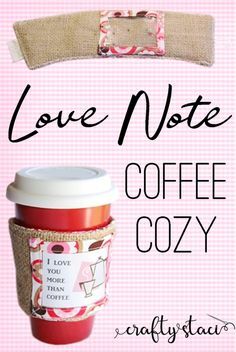 Some knit fabrics work best with an iron-on backing in addition to a stabilizer to prevent stretching during the stitching process. These will all be explored in upcoming articles. 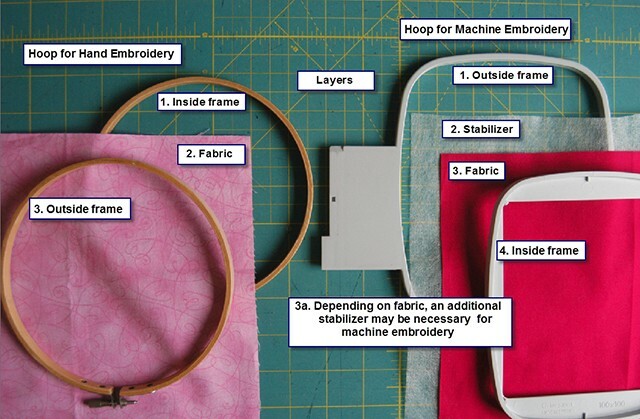 In general, thinner fabrics tend to be easier to hoop than thicker fabrics. Smaller hoops are easier to work with than larger ones, so use the smallest one that accommodates the chosen design. Sulky Stabilizer is a must. “Quality” is paramount for all supplies from fabric, to design to thread and most importantly, the design’s foundation….stabilizer. Sulky offers a wonderful selection of the various types of stabilizers to fulfill every requirement ever needed in any project. Sulky stabilizers are also able to be used in multiple applications. To demonstrate the various hooping steps, we will begin with a medium-weight, woven, cotton fabric. 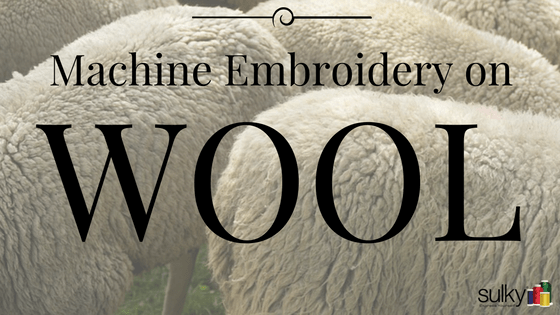 This fabric is the easiest to work with for both learning or perfecting hooping skills, and for learning about machine embroidery in general. 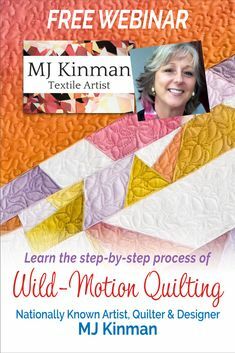 The best part is the wide variety of projects that mid-weight cotton is suited for. When hooping, it is very important to work on a hard, flat surface. 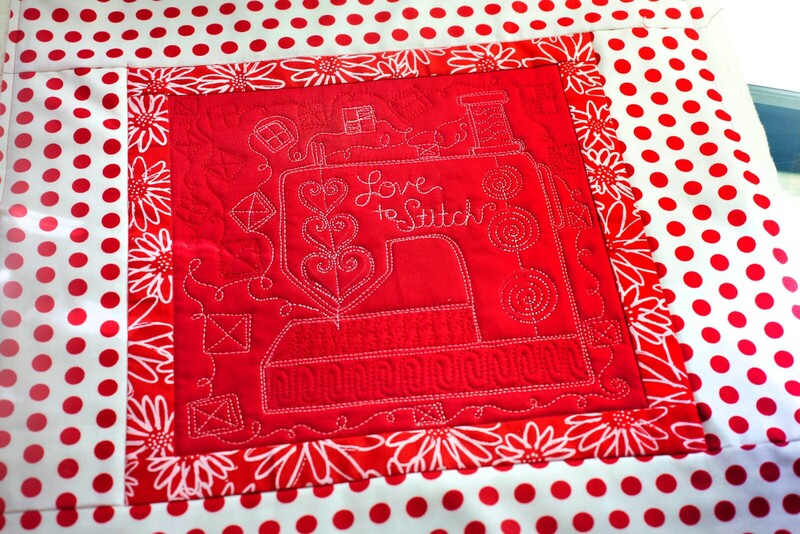 I work on top of a sturdy table, and I often choose to add a quilter’s cutting mat so that the grid lines are available as a reference. 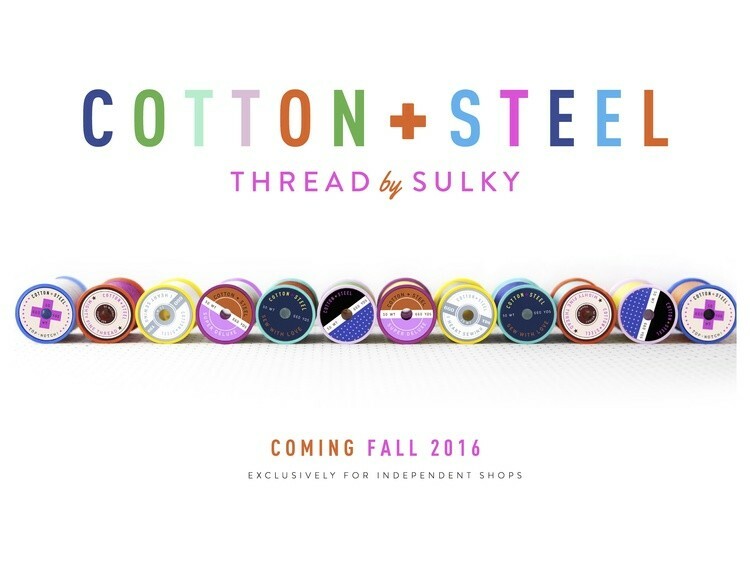 The lines can easily be seen through Sulky Soft ’n Sheer™ Stabilizer, but even when the lines cannot be seen under the stabilizer, simply squaring the hoop’s frame to the grid lines will prove to be a huge aid in hooping fabric straight on grain. Step 1. 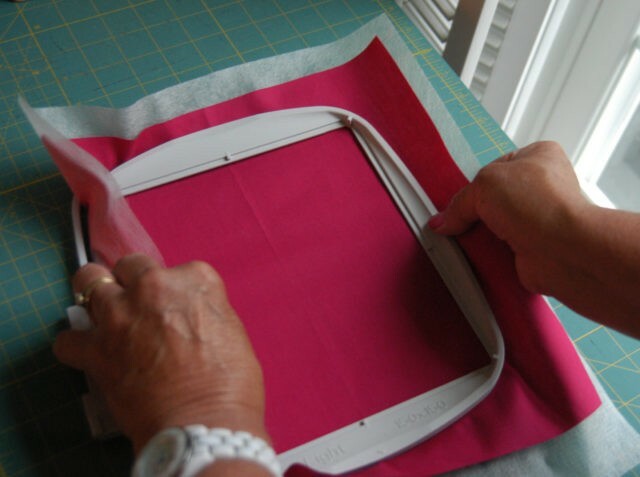 Make sure your fabric and stabilizer are cut larger than the hoop currently being used. Stack the layers in order beginning with the stabilizer, topped with cotton fabric and the inside hoop frame. Line up the center marks of the hoop with the center marks of your fabric as accurately as possible. Keeping equal pressure on opposite sides, gently pick the stack up by folding the stabilizer/fabric up over the frame’s side anchoring with thumbs on the hoop frame. Step 2. Center the stack over the outer frame (the piece that attaches to the embroidery machine) and seat the bundle inside. Feel for the underneath frame with the pinky and ring fingers of both hands while keeping the thumb on top of the fabric bundle holding it taut and wrinkle free. With the index and middle fingers press the unit into the inside frame. Step 3. Push the top frame with the stabilizer and fabric down into the outside ring which should already fit fairly close to the inside frame even with the added layers of fabric and stabilizer. Before tightening the frame, gently smooth out any wrinkles. 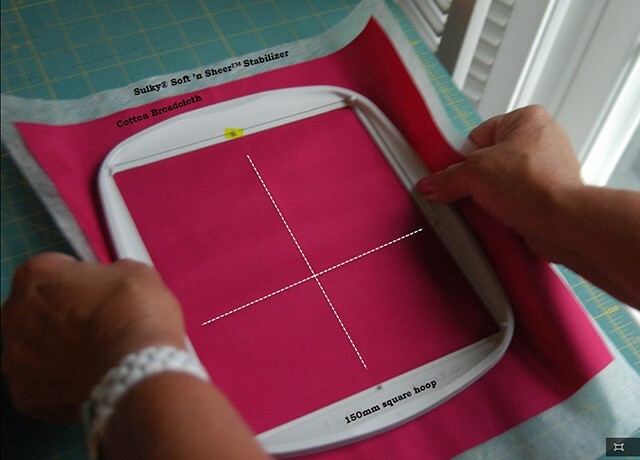 Note that the crease of the fabric is lined up with the top and bottom frame notches to demonstrate keeping the fabric straight on grain within the hoop. If all is good, tighten the outer frame as snug as possible to the inner one. Step 4. However, if wrinkles are present, prior to tightening the frame, try bracing the frame with one hand while the other tugs only the stabilizer. Hold the stabilizer and pull it up and out from the frame on all four sides while anchoring the frame with the other hand. Technically it is actually a good idea to tighten the stabilizer but only the stabilizer, on all four sides even if wrinkles are not present. The stabilizer should be just as tight as possible in the frame. If wrinkles are present and were not removed while tightening the stabilizer, begin the process all over again from Step 1. 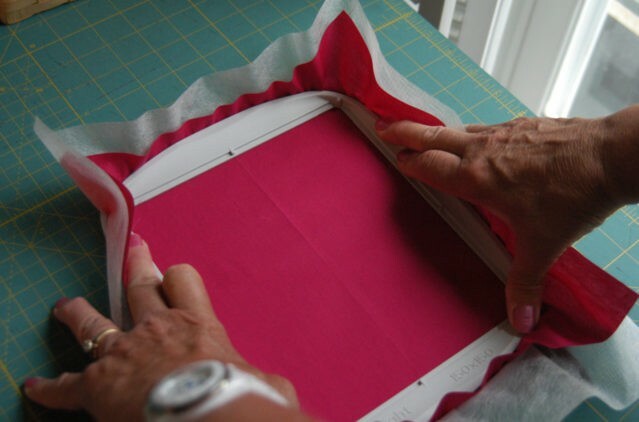 The tendency to tug on the fabric to tighten or to remove wrinkles is hard to resist, but it will only prove to be extremely counter-productive. Woven fabric is made from weaving fibers in a set pattern with specific spaces in between rows. Pulling on a side to remove a wrinkle causes the weave in this area to distort. Tugging on all four sides stretches the weave at uneven ratios. Therefore, once the tension of the hoop is removed, the fibers will relax. However, since they were stretched at varying degrees, they will also relax at different degrees, causing puckering. You may know that generally speaking, we suggest using tear-aways for wovens and cut-aways for knits. But there are exceptions to that, in fact there are really just guidelines in the embroidery world. 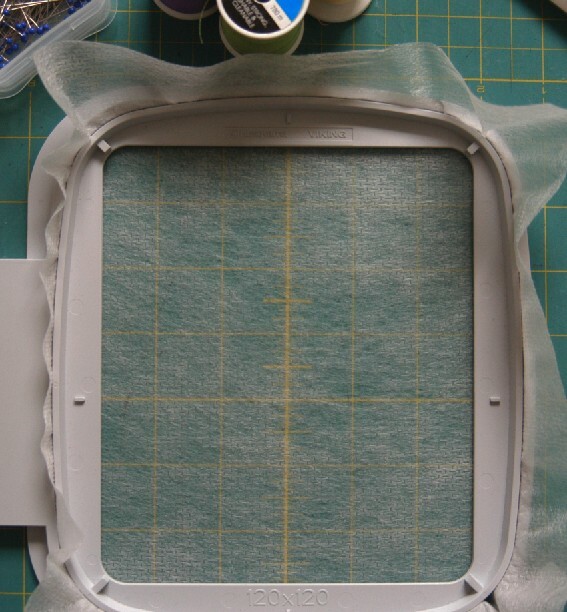 And if you love a stabilizer like Pamela does (and believe us, she is an expert), she prefers using Sulky Soft ‘n Sheer for 95-99% of all her projects. 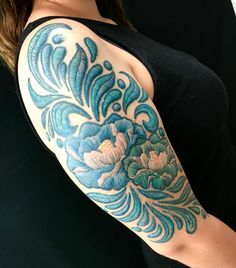 Everything she does turns out beautiful, and we love that she has a “favorite” and it’s one of ours! I hope these hints about hooping have been helpful! 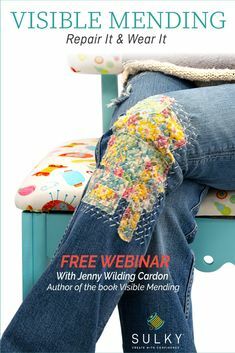 What hints have you picked up over the years to help you with hooping embroidery projects? Let me know in the comments below. Helpful article. I have been embroidering on Pfaff embroidery machines since I bought the 7570 in the late 90’s. I was pretty good at hooping until last year when I developed arthritis in my hands. Hooping caused painful hands until I saw a magnetic hoop at my dealer. 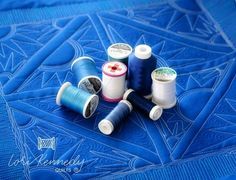 I now use the magnetic hoop and have been quilting my smaller quilts using the magnetic hoop and the designs from Edge-to-Edge Quilting on Your Embroidery Machine by Amelie Scott.